We offer a complete line of tabledrapes and tablethrows in a rainbow of colors. As you scroll down this page, our "swatch cards" will give you an idea of the standard fabrics and colors available. This is your best choice for one large logo or message. Choose between the X-Press Scan, Screen Print, or full color RasterPrint process and use the accompanying Set-Up Charge below. All fabrics are flame retardant and meet FR Code 701. This attribute is required by most local Fire Marshals around the country. A flame retardancy certificate will be shipped with your order so you won't have any problems at the trade show or other public place. A note on "swatch cards": Please realize that the following samples are limited in their ability to accurately depict colors. Every computer display is calibrated differently and therefore colors can vary from computer to computer. These swatches should give you a relative idea of color selection. If you need a more accurate color depiction, call or email us and we'll send you an actual swatch sample. Even with actual swatch samples, please keep in mind that dye lots can vary. PMS numbers are given to aid you in determining the best match. +'s and -'s denote "darker" or "lighter" than. For instance 1895+ means "one shade darker than PMS # 1895", and 209-means two shades lighter than PMS #209." Please realize that these numbers are somewhat subjective and not intended to be exact matches. This 100% polyester fabric is our most popular because of its durability and wrinkle free characteristcs. It is lightweight and has a smooth opaque finish. Flame retardent. Cameo is 100% polyester and has the look of suede. Flame retardent. Both of these fabrics should be machine washed in warm water (120 degrees F / 48 degrees C) with a mild detergent and no chlorine bleach. Tumble dry at lowest heat setting. Remove immediately from dryer to prevent wrinkling. Avoid extreme heat to preserve quality of permanent press fabrics. No ironing is necessary if care instructions are followed. Imprinted fabrics should not be dry cleaned. If pressing is required, iron or steam from the back side (side opposite logo) of fabric. 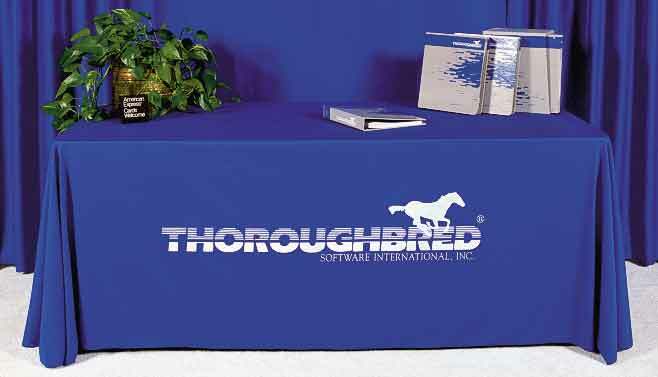 X-Press Scan is a print process that permanently imprints your logo or message on any of our fabric display items. Unlike traditional silkscreening, X-Press Scan does not require expensive screens. However, like silkscreening, X-Press Scan is a permanent process that will not fall off or wash out. Limitations: If we are unable to use X-Press Scan for one of the following reasons, we will use traditional silkscreen imprinting. Maximum quantity of 30 items. Very fine detail (such as dot patterns) is not recommended. Fax logo for recommendation. A note on "swatch cards": Please realize that the following samples are limited in their ability to accurately depict colors. Every computer display is calibrated differently and therefore colors can vary from computer to computer. These swatches should however give you a relative idea of our color selection. If you need a more accurate color depiction, call or e-mail us and we'll send you an actual swatch sample. PMS numbers are given to aid you in determining the best match. +'s and -'s denote "darker" or "lighter" than. For instance 1895+ means "one shade darker than PMS# 1895", and 209-- means "two shades lighter than PMS# 209." Please realize that these numbers are somewhat subjective and not intended to be exact matches. �RasterPrintSM - Full Color Images on Fabric! RasterPrintSM is a full-color photographic fabric imprinting process. 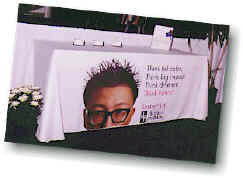 With RasterPrint, we will permanently transfer your photographic images to our banners, table runners, throw covers, and even wall murals! 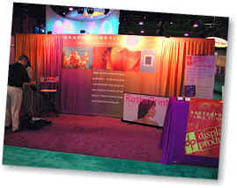 Imagine the backwall of your booth covered with striking full-color graphics instead of the standard drab draping supplied at the trade show. And because the image is on fabric, you can easily store and transport it without fear of damaging wrinkles, tears or folds that plague graphics on paper or other substrates. RasterPrint is an exciting new offering. Using digital dye-sublimation technology, your full-color (even photographic) images are permanently transferred to one of our many fabric products. Not to say that dye-sublimation is new. 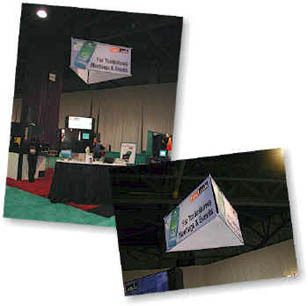 While many companies have only recently discovered the technology, our supplier was involved in the introduction of the process to the trade show exhibit industry way back in 1993. At that time we called the process Colorized X-Press Scan. RasterPrint replaces and greatly improves on the older Colorized X-Press Scan offering. 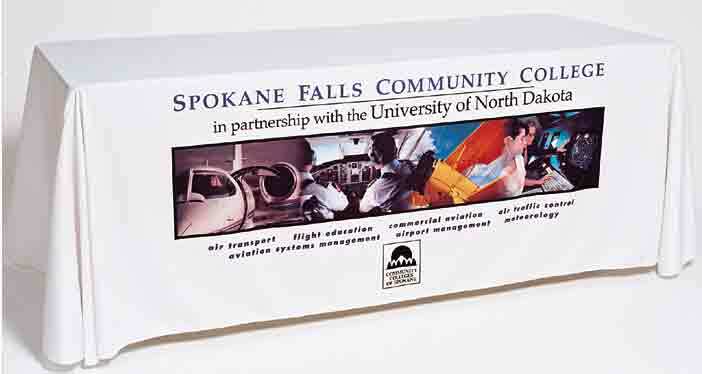 For starters, RasterPrint produces images up to 52" wide without a seam. This means larger banners and wall murals with fewer seams. And because the equipment we use for RasterPrint is faster and wider, our efficiencies have increased and we are able to offer the service at a lower cost to you! But that's not even half the story of RasterPrint. Because RasterPrint yields an unlimited number of colors for the same low setup and print charge, many customers have found that RasterPrint is the only cost effective solution available when they want a small quantity of banners or throw covers with multi-colored logos. Imagine the cost of a single throw cover with a 8 color logo! (Or don't imagine- get a quote from us or another screen printer.) So while screen printing may still be preferable for large quantities, RasterPrint is the only way to go for small quantities of multi-color imprinted items.